Rory Patterson and Gerard Doherty both made claims to be the City hero with late interventions to ensure all three points for the home side. First Doherty saved a Killian Brennan with eleven minutes to go when the score was 1-1 and then Patterson fired home from a McEneff ball to make it 2-1 in the 89th minute. City had the made the perfect start when Ally Roy scored after only four minutes, when he beat veteran Brennan for pace and drove the shot low to the bottom corner. having made three changes from Monday night’s heavy defeat in Cork, it could have been a better opening to the proceedings for the home support. City could have made it two moments later when Rory hale robbed Conan Byrne but he fired his effort just wide of the post with Clarke scrambling to get across to cover. 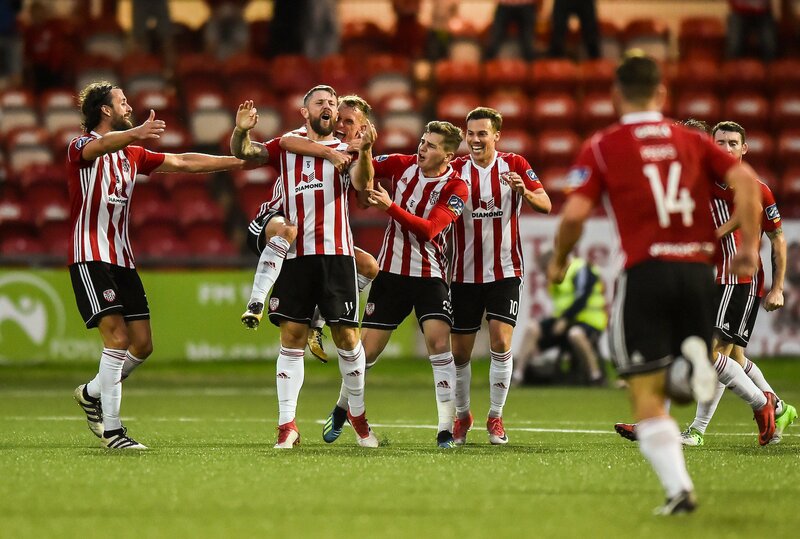 However the visitors also proved that just like the earlier game in the Brandywell and they had an effort strike the post on 14 minutes when McEneff lost possession and Brennan clipped the post. MeEneff showed this threat from set pieces when he warmed the hands of Clarke from 25 yards but slowly the visitors came more and more into the game. They were back on level terms on 33 minutes when City failed to clear the ball from close to their own goal and Ryan Brennan bundled it home from 3 yards. The visitors were in control at the start of the second half and Doherty did very well to push Killian Brennan’s header just over before the hour mark. Again Doherty did very well to claw Conan Byrne’s header five minutes later as the City cause was wobbling. City were restricted to hitting Pats on the break and a long ball from the back deceived Bermingham. Substitute Ronan Hale raced clear but a narrow angle and good work by keeper Clarke saw the effort go wide for a corner. The closing stages of the game exploded into life when Pats were awarded a penalty. City failed to deal with a quick free kick and Madden was bundled over by Fisk. Harvey had no hesitation in pointing to the spot and there were little protestation from Fisk. although Peers did pick up a yellow for his complaints. Ex City player Killian Brennan stepped up and his effort was saved by Doherty. The home fans, sensing this could be a turning point, cranked up the noise as the game was poised on a knife edge. Moments later, McDonagh did brilliantly to block an effort on the line. City grabbed the late winner when McEneff surged forward and squared to Patterson who fired it home from close range. The action was far from over when Harvey produced three red cards in injury time after an off the field incident. Bermingham and Thomas Bryne were sent off for the visitors, with Eoin Toal also red carded for the home side. Derry City: G Doherty, Toal, Peers, Seaborne; McDonagh, Splaine (Ronan Hale 61), Rory Hale, Shiels, McDermott (Fisk HT); McEneff, Roy(Patterson). St Patrick’s Athletic: B Clarke, Madden, Desmond, K Brennan, Bermingham; C Byrne (Turner 77), R Brennan, Markey, D Clarke, Lennon, Keggan (T Byrne 70).